Christina joined the Gateway family in August 2012, wearing many hats including Mortgage Loan Originator, Quality Control and Receptionist. Her hard work and dedication to her clients pours into her work as she focuses on going above and beyond to build personal relationships, feeling that terrible customer service is her biggest pet peeve. She’s often stated that when a customer has a question, they deserve a follow up. Working with clients to obtain their dreams of homeownership is an amazing reward that makes every day as exciting as the last. She recently helped a client refinance to keep the same payment but pay down their loan in half the time. She is from Racine, and attended Racine Washington Park. She’s been married to her husband, Jeremy, for 5 years and the couple has 4 children; Tyler, Ashley, Kaylea, Alyssa. When away from work the family loves to get out and enjoy nature by camping and fishing at the River Bend Resort in Watertown. 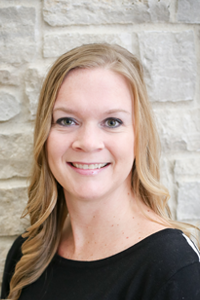 She also spends a lot of her time enjoying watching her kids play sports as well as taking the family to the occasional Green Bay Packers and Milwaukee Brewers games. Christina absolutely loves the state of Wisconsin and especially the local flavor. She recommends Racine destinations such as North Beach and Oh Dennis! Saloon when in the area and also suggests that everyone check out Lambeau Field and Miller Park at least once in their lives.